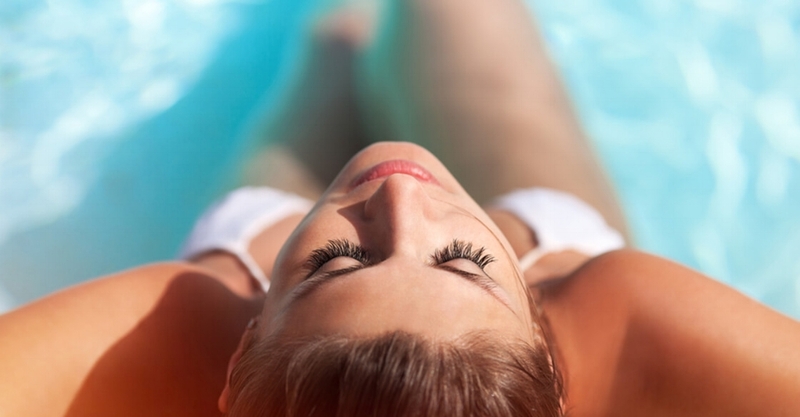 Summer Tips to Keep your Eyelash Extensions in Great Shape! And I want you to enjoy all your favorite activities without sacrificing your eyelash extensions. You may notice that in warmer months you will feel the need to schedule refills more often. There are many factors that will contribute to needing more fills such as changes to your lash cycle, being more active, and temperature increases, to name a few. These factors you can'tcontrol, but below you will find a few extra tips to help combat all natural elements and preserve your eyelash extensions. Yes! Use sunscreen, just not on or near your eyelashes extensions. Sunscreen will act similarly to oil and cause your eyelash extensions to fall out sooner. Try to wear goggles when possible in seawater or a chlorinated pool. After swimming, always rinse your eyes and eyelashes with fresh water. This will help remove some of the salt water or chlorine from the eyelashes until you can cleanse your them properly. Similar to swimming, rinse your eyelashes after working out especially if you are a heavy sweater. Salt from your sweat can settle on the eyelash extensions and cause retention issues. When enjoying your island getaway in the sun, wear sunglasses and hats. Not only will they protect your eyes and skin from the harmful rays, but also shield your eyelashes from the intense heat. And of course, the less you do, they better they hold up. So admire, but don’t touch too often. A lot of times we have dirt and oil on our fingers that we are not even aware of that we transfer to our eyelash extensions. So skip the urge to touch! Are you tired of filling in your brows? Do you have fine hairs that are barely noticeable? If so, brow tinting might be the answer to your problem. Intensive Brow Tint is made from a vegetable dye that is safe for facial use. During this quick treatment, the chosen color and developer are mixed together and applied to the brow hair. As the mixture processes, the color is deposited resulting in a defined and sharpened look. If you are ready to chuck the brow pencil and brow powder, a professional brow tint might be the answer to your prayers. Well Being Goals for 2017! I wanted to share with you some of my New Years “Well Being” Goals. As you know, I am all about quick and easy beauty tips so here are a few I hope to incorporate into my routine this year! I hope you find some of them useful. Sleep Earlier – I’m the girl that gets re-energized at 1 am if I stay up too late….and then I kick myself in the morning when I look and feel tired. To help, I will be setting a “wind down” alarm. I will set it a half-hour before my bedtime to cue sleep mode. Water– I plan to drink 16oz of water first thing in the morning. To make this fool proof, I’ll set the bottle on my nightstand the night beforeso I have no excuse. Even if I don’t get out of bed right away, it is just within arm's reach. Scalp Massage – I LOVE getting my hair washed, but more importantly the scalp massage is cherry on top. Scalp massages can instantly decrease stress and boost your mood. I’ll be aiming for once or twice a week for 5-10 minutes. Express Gratitude – For life, health, sunshine, or whatever else I'm thankful for. Focusing on the good weakens the impact of the bad. What are some your goals for 2017?